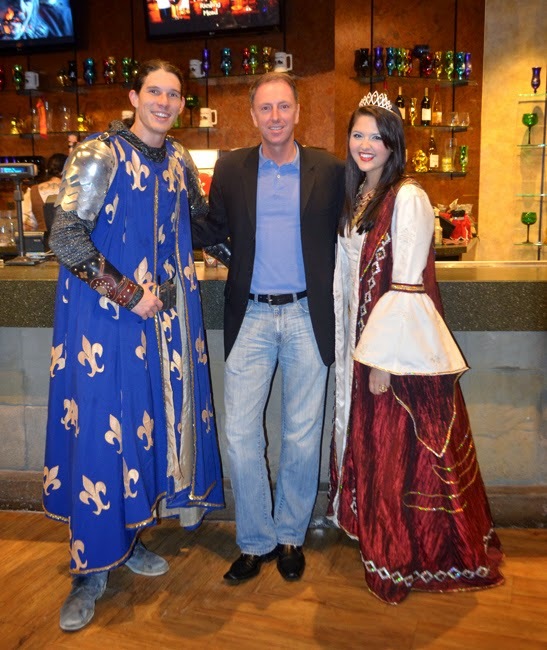 One of my favorite aspects of the Medieval Times Dinner & Tournament experience is the multitude of photo ops. What? Me...photo ops? Surprise, surprise, right. That the King, Princess, knights and squires, wenches, falconer, and every other person on the kingdom's payroll (not to mention the magnificent horses, the falcon, and the owl) make it so much fun makes it all the more a splendid experience. 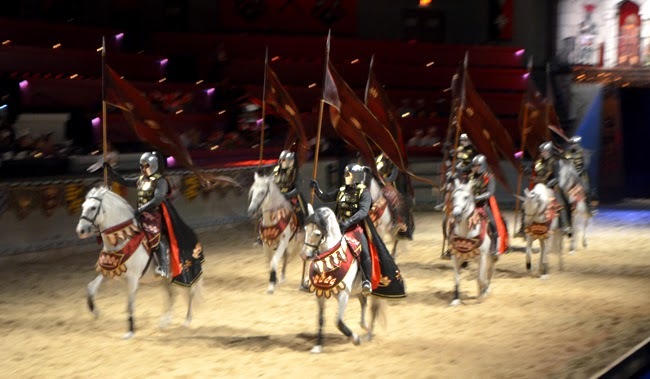 I've been to the Atlanta Castle a couple of nights recently, and brought along a number of friends who had yet to experience the gallantry of the knights, beauty of the princesses and the majesty of those magnificent horses...quite so close up and in-person! Let me jump right in an tell you about the little princess pictured above. It was her birthday and it's one she'll never forget! After the Blue Knight won that tournament, he and the Princess crowned her Tournament Princess! She, her sister and her father (who gave me permission to share the photo) were sitting right next to us and her crowning made the evening all the more fun, for everyone around. She was an enchanting and distinguished little princess, one to be commended for her grace. There's a LOT going on before (and after) the doors to the Arena are opened, including the opportunity to meet one of the stars of the show...Echo! Echo is a falcon who has been performing at the Atlanta Castle for approximately 4.5 years now. 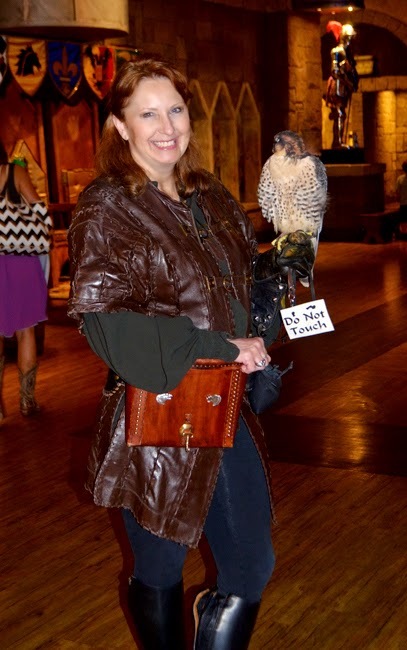 His (I think it's a "he", but truthfully I didn't confirm that) trainer is Lady Anne (pictured above with Echo), a Master Falconer. He adoration and great care for Echo is immediately apparent when you start talking with her. When you visit, seek out Lady Anne and Echo. She will gladly share with you some insight into why Falconry is called "The Sport of Kings" and give, if asked, a little more detail about the training and how it's less a performance but a mutual cooperation, true to nature. Echo is a spectacularly beautiful creature and I was so fascinated to have met him...and Lady Anne, too. 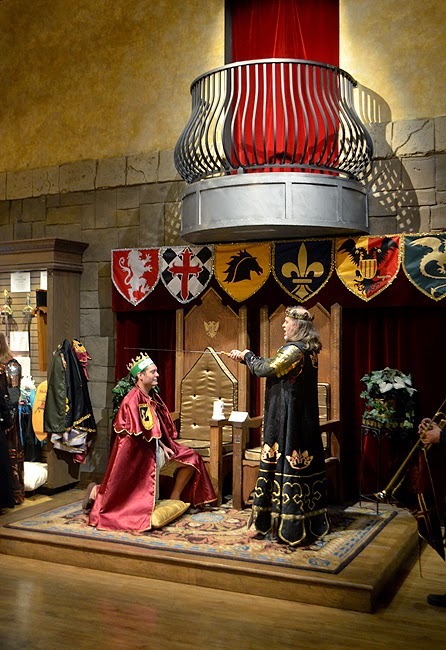 When you visit, you may have the opportunity to be knighted by the King! Especially if you're celebrating a birthday or anniversary or other special occasion. I'm not sure who that is in the above photo...another visitor to the Castle, there to celebrate a birthday, I believe. I think it's cool that someone who's more than eight years old (and there were those, too, of course) wasn't at all shy about being knighted! Who doesn't have dreams of being a celebrated knight (or princess, as the case may be), right?! Just to the right of the knighting ceremonial space you'll see a series of tall vertical windows. Go over to those and peer into a habitat that houses a splendid owl, one that belongs to the largest owl family in the world! It's wing span is nearly as wide as I am tall! Ask Lady Anne about it when you're meeting Echo. 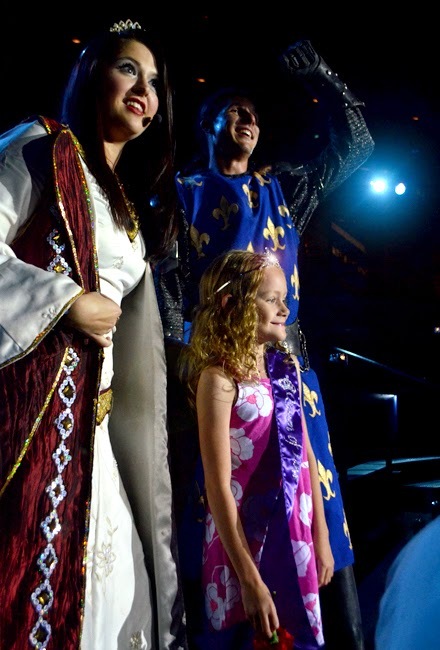 Before the King takes to his observation tower with the Princess, he'll be on the arena floor to greet the knights, who had been introduced as visitors were welcomed into the arena. Be sure to listen for details of the knight for whom you'll be cheering—you'll know which one he is by the color of your own crown. Oh, and while I'm talking about the King, as you enter the Castle, you may have a souvenir photo made with either the King or the Princess. On my most recent visit, we opted for a photo with the King. The Princess is prettier, but my friends wanted a photo with the King...a great photo to have, just in case. You can pick up your souvenir photo almost immediately! The 8"x10" photos are beautifully framed in a heavy stock paper folding frame with opulent detailing. The first copy is only $20 and subsequent copies are only $10. We got two, Ashley's treat..."Thank you, Ashley!" The tournament is a fun-filled two hours long...and there's a LOT going on. As many times as I've been—and I love it every time!—I've not yet committed to memory the precise naming of the segments of the tournament. Good thing there's not a pop quiz at the end! The procession above is, however, one of my favorites. I love how regal it is. The horses, their dress, the knights, the flags, the...everything about it! From the time you enter the Arena to the time you leave, there's some sort of performance, gallantry, contest...it's action-packed! Even while your "wench" (who have all be wonderfully entertaining, highly attentive, and impressively professional—Thank you, All!") is describing what's about to happen dinner-wise—and be sure to pay attention, she's imparting very important information—there's still a performance taking place on the arena floor. As I'm sure you can imagine, there are more than the the six knights who participate in the tournament. There are the squires, the game masters, the flag bearers, and I'm sure I'm forgetting a few others. It takes an army to stage a tournament of this magnitude! Oh, and there's the evil visitors from another land—the whole reason for the tournament! Actually, that's not true...the tournament is for the entertainment of all the Lords and Ladies who are there to have a great time! 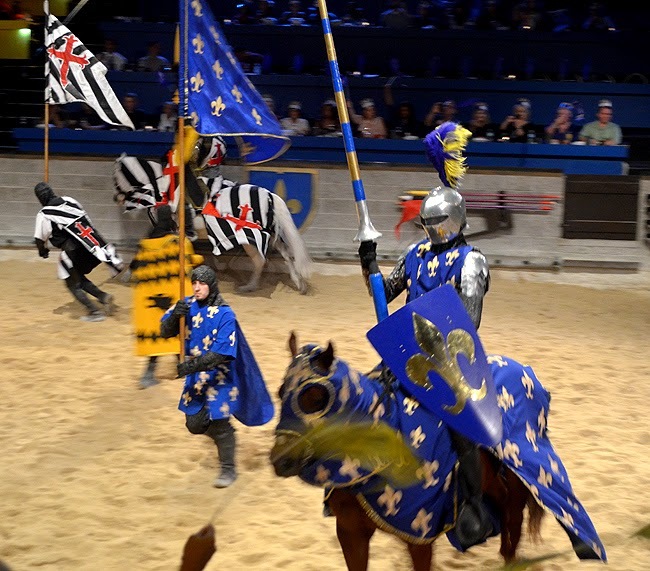 But Medieval Times makes a drama-filled spectacle of a tournament, for one and all. I'd love for you to learn more about the horses. 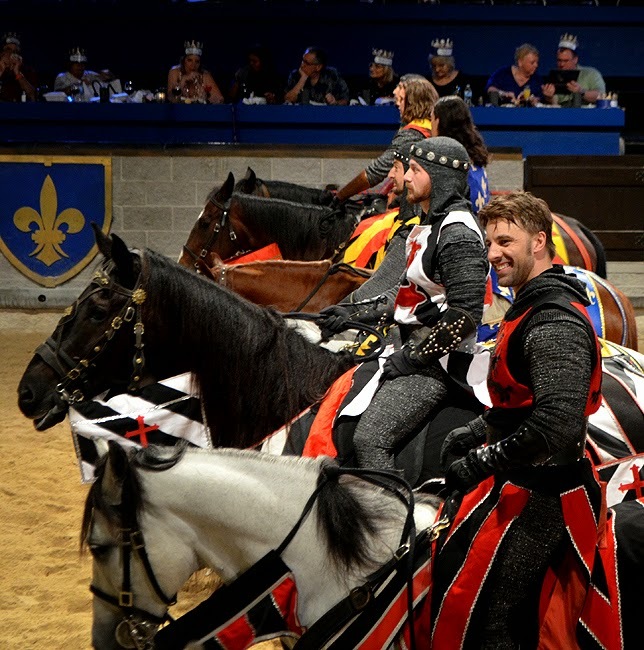 You'll get to know the knights before, during and after the tournament, but be sure to get to know something about the horses before you go, so that you can fully appreciate the performance you're seeing. The horses are magnificent and it's obvious—to me, having worked with horses—that they're very well cared for, and pampered I'm sure. After only a few years of performing, they retire to their original home where they live out their natural lives. Lady Ashley (pictured above) is a dear friend and not at all shy about having fun, and she also has an impeccable work ethic, both of which are qualities I admire in her. So, while other friends have been somewhat timid about having photos made with the knights and princesses (and I can be that way, too), not Ashley! I don't think I'd be very far off base if I were to assume that Ashley subscribes to my philosophy that life is too short to not have as much fun as you can! That life is meant to be enjoyed and we often take it too serious. Yes, it's important to work hard and do the job you're paid to do, but it's also great to venture into other realms, from time to time. 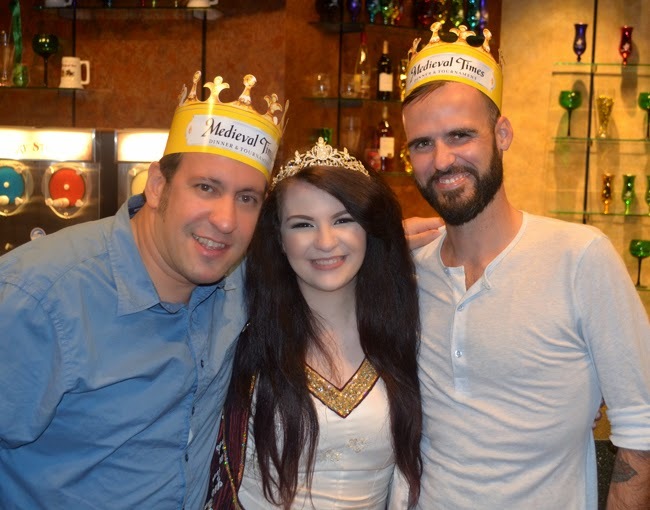 Ahmad and Dave were on the same visit with Ashley and they were all three a total blast to as Lords and Lady. Thank you all three for a glorious adventure with the knights! I'd be remiss to not mention the Dinner! The most fun about dinner is that you enjoy it Medieval-style. Do you know when forks and spoons came into popularity? The meal is a feast. I see most people take leftovers home, but I'm a trooper when it comes to the dinner plate. I want to enjoy the full experience in the moment. Four courses are served and the meal includes a non-alcoholic beverage. But not to worry for those who wish to enjoy an adult beverage. There's a full bar and table cocktail service, as well. If you enjoy wine with your meal, you can even pre-order a bottle a the bar in the Great Hall before the arena opens and it'll be delivered to your table with no wait. Remember to plan to leave a tip for your serving wench. Like practically all dining establishments in the modern world, gratuity isn't included with your ticket...and please be generous. They're working folk just like you and I—and they've been impressively remarkable every time I've been! While you're exploring the Castle, have a close look at the suits of armor peppered throughout the Castle...the detailing is quite spectacular. 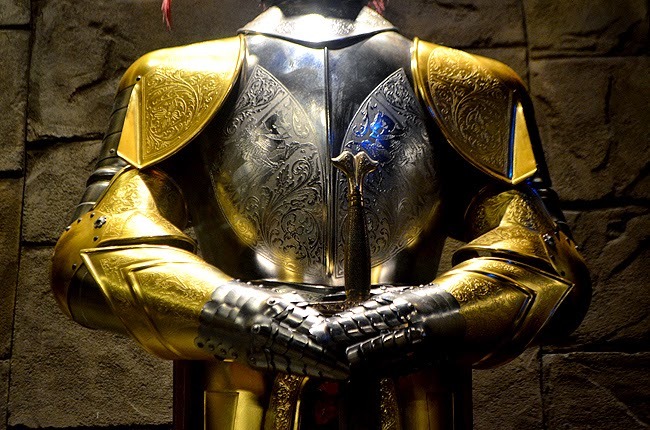 Since I was a kid I've been a fan of the Medieval era, and especially of armor. On one of the recent visits, my friends who have a place overlooking Centennial Olympic Park were along. They have a suit of armor who we all respectfully refer to as Henry. It's nice to know that he's always there to guard...and how cool to have a real suit of armor! And I was quite surprised at how reasonably priced the armor elements, swords, and other assorted items are in the gift shop. No, I wasn't asked to mention the gift shop, I've just always wanted a sword. Well, of course I'm going to get in on the photo ops! Remember, that's part of the fun. And every single person I asked to make a photo with or of was happy to pose. I hope they realize how great a finish that is to an already wonderful evening. One recommendation—and I should take my own advice—Don't get so caught up in the picture-taking that you miss the tournament or miss having a grand time with your family and friends. You can always visit again and make more photos. "Be swept away to an age of bravery and honor and witness epic battles of steel and steed. From ringside seats, discover a feast of the eyes and appetite with all the splendor and romance of 11th Century Spain. 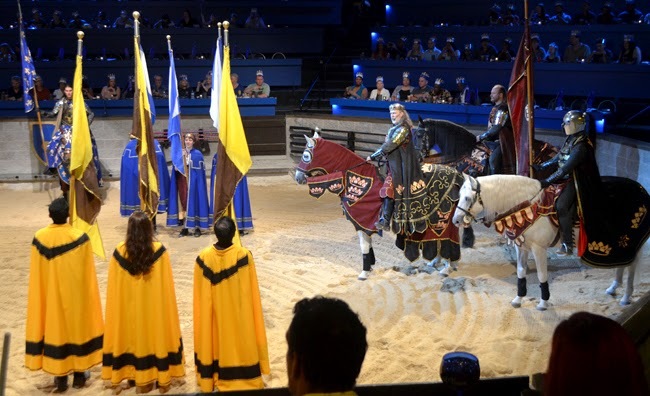 As you thrill to a rousing, two-hour live jousting tournament, marvel at awe-inspiring horsemanship and falconry, Medieval Times serves a four-course meal fit for royalty." 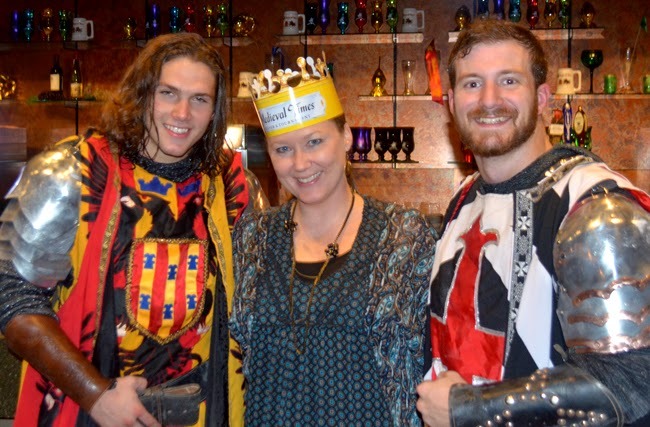 Head over to the wanderlust ATLANTA Facebook page for more photos of my Medieval Times Dinner & Tournament visits...hope to see YOU at the Atlanta Castle sometime soon!